Take a look at the red pigments on your palette. Each red has either a warm or cool cast to it. 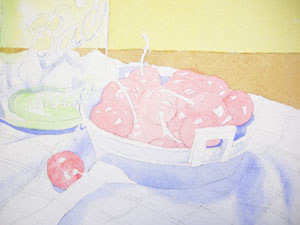 I used a very wet wash of Winsor Red on the cherries to provide a base color for the subsequent glazes. This is probably 90 percent water and 10 percent pigment — very wet. I did not mask the highlights in the cherries for this painting, so I just painted around them. If you have a difficult time with painting around those tiny areas, you may want to add a little masking fluid first. I think it is good to learn to paint around, besides I don't like to take the time to mask, and then remove it later. I do use masking occasionally, but obviously I chose not to for this piece. I have left a tiny little white area around all of the cherries at this point to create a separation between them visually. Later on I will fill this in with color, but for now I will leave the white area. It also helps me to see where each cherry begins and ends because as I work with the wet paint it will often lift the graphite and the pencil lines will disappear.